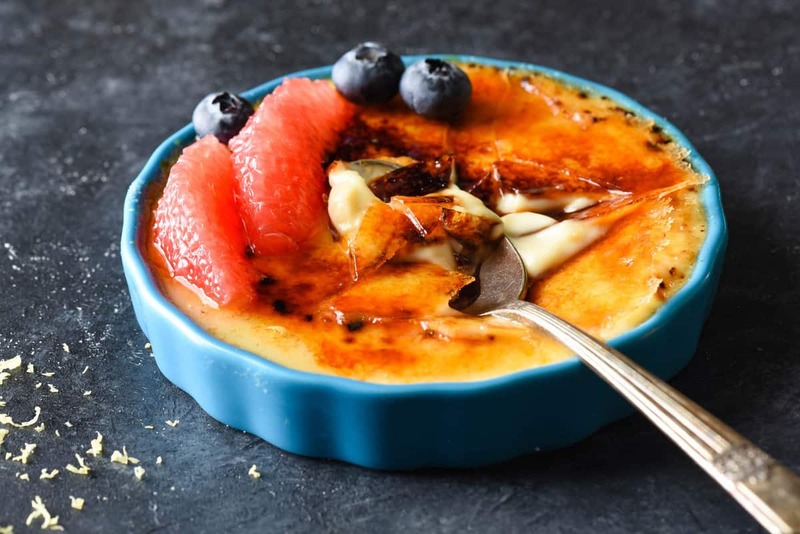 Preparing, torching and serving this Grapefruit Crème Brûlée is bound to make you feel like the kitchen superstar you are. Rich custard is flavored with sweet grapefruit juice and zest for a refreshing twist on a classic dessert. If there’s one dish that exemplifies the “home chef” philosophy of this blog, I think it would have to be crème brûlée. It was one of the first things I was taught to make in culinary school (although I had already made it at home before that). I hardly ever order dessert at restaurants, but when I do, it’s crème brûlée. And I think it defines “simple, yet special” when it comes to cooking at home for loved ones. Preparing it, torching it (!) and serving it is bound to make you feel like the kitchen superstar that you are. 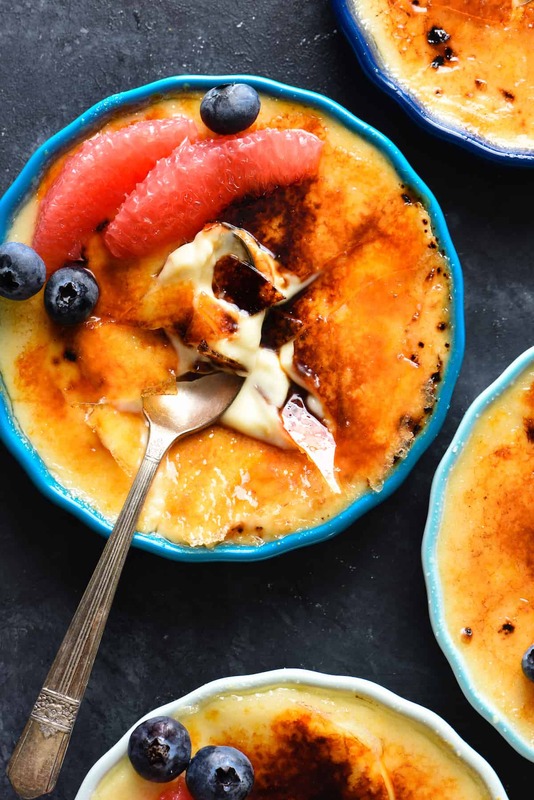 While you can never go wrong with classic crème brûlée flavored with vanilla beans, it’s also lovely with subtle flavorings added to the custard. This time of year, my fridge is overflowing with all kinds of citrus fruit, but most especially sweet grapefruit. 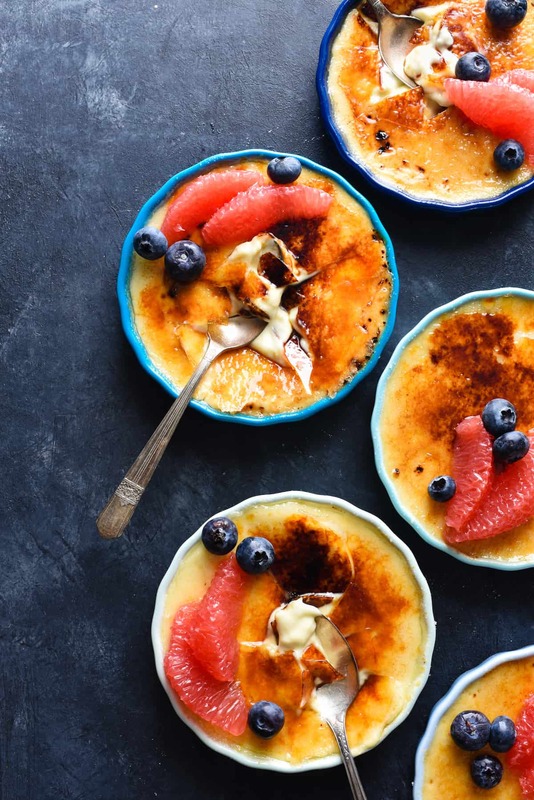 This Grapefruit Crème Brûlée is my home chef love letter to whoever invented the blow torch. Keep an eye on the cream and sugar mixture while you cook it on the stove. You do NOT want it to fully boil; just begin to bubble around the edges (this technique is called scalding and jump starts the cooking process before putting the custards into the oven). MAKE SURE you strain the custard mixture through a fine mesh strainer in Step 3. This is essential to remove any microscopic bits of cooked egg that would ruin the mouthfeel of the finished custard. Winter Sweetz grapefruit is my choice for this recipe (and all grapefruit recipes and snacking, really). These Texas-grown grapefruit hit peak sweetness from November to March, and ripening during the winter leads to a sweeter fruit. I’ve included both grapefruit zest and juice in the custard mixture, and also topped the finished dessert with fresh grapefruit segments. For more information about Winter Sweetz grapefruit, please visit WinterSweetz.com and follow them on Facebook, Instagram and Twitter. Also, be sure to check out the “Healthy Eatz with Winter Sweetz” Sweepstakes for a chance to win a $500 Amazon gift card or a shipment of grapefruit! Preheat oven to 300 degrees F; heat large kettle of water to boiling. Place six 5- to 6-ounce ramekins in roasting pan. In small saucepan, heat cream and 6 tablespoons sugar over medium heat 6 to 7 minutes until cream just starts to bubble around edges of pan (do not bring to a full boil). Meanwhile, in large bowl, whisk egg yolks, grapefruit juice, vanilla, salt and remaining 3 tablespoons sugar until well combined. While whisking, use ladle to slowly add 4 ladlefuls of hot cream mixture to egg mixture. Gradually whisk in remaining cream mixture. Strain through fine mesh strainer into large liquid measuring cup. Stir in grapefruit zest. Divide custard mixture between ramekins; place roasting pan in oven. Add enough boiling water to come halfway up sides of the ramekins. Bake 35 to 40 minutes or until custards are just set (they should tremble slightly in the middle, but be set on outer edges). Use tongs or pancake turner to carefully transfer ramekins to cooling rack; let stand 30 minutes. Cover with plastic wrap and chill at least 4 hours or up to 2 days before serving. To serve, sprinkle 1 tablespoon sugar over each custard. Using blowtorch, caramelize top of each custard until sugar bubbles and turns brown (this can also be done under a broiler). Top with grapefruit segments and blueberries and serve immediately. Easy Baked Brie with Grapefruit & Pistachios – bookmark this for your next party! Winter Citrus Salad with Avocado-Basil Dressing – make this for lunch! Disclosure: This was a sponsored post written by me on behalf of Winter Sweetz. Sponsored posts help me pay for the costs associated with this blog (groceries…lots of groceries), and help support me as I pursue a career in recipe development and food photography. All opinions are 100% my own.